Join us for a Kalahari Safari. A few spots opened up. Also spaces on our Chobe Safari. 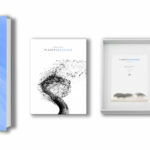 See dates below. 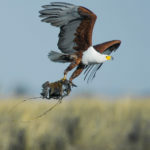 PHOTO: Fish Eagle with white-faced duck in claws. After a huge fight between 2 hippo bulls the older male died because of all his wounds and blood-loss. The carcass drifted for a few days and after the crocodiles had their fare share, the smell attracted hyenas and they walked in carefully to drag the remains out. After feasting for a while 2 lions appear on the other side of the river. To avoid getting eaten by crocodiles they walked downriver to cross the river where it was more narrow. The hyenas ran away and the lions feasted on the remains the whole night long until early morning. Now and then the hippo bull responsible for the other’s demise walked out of the water for some strange reason, to chase the lions off. 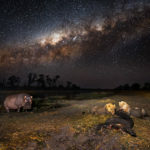 I tried to capture the whole seen, two lions feasting, hippo and the river in the background, including the milkyway that stretched across the skyline. 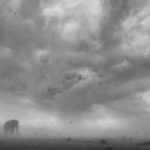 Savuti Sandstorm & Flying elephant dung! 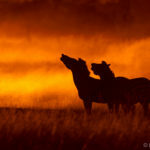 Join me & Noa for an unforgettable 7 days Photographic Safari Experience to the Savuti and Khwai in Northern Botswana. There is only 2 spots available. Attached photo was taken last year in Savuti during a sandstorm. 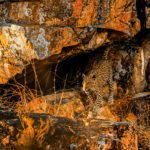 Attached photo was taken last year in Savuti where a female leopard emerged from a cave, walked and scent-marked all along a rock-cliff. Good morning everyone. Me and Noa are back in South Africa sorting out logistics and all our photo-safaris for the year. 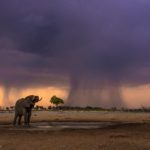 Join us for an unforgettable Photographic Safari Experience on the Chobe River (6 Days), Savuti & Khwai-River (6 Days), Okavango Delta (8 Days), Kalahari (6 Days) or Namibia (14 Days). I will be speaking again at the Cape Town Photo Club on Wednesday the 1 March 2017 about our life in the bush, and about our Okavango Project, and our new Publication. The venue is bigger this time, but booking is essential. See link below. Time: 5pm for drinks in the bar and then the talk will start at 6pm. Dinner: Please do stay for dinner. 2 course meal needs to be booked in advance R200 pp incl tip. Good morning everyone. A beautiful and prosperous new year full of adventure and great photography for everyone! The Okavango Delta has been home for me and Noa for more than two years now, where we spend a majority of every year living in our tented camp deep in the bush, just to immerse ourselves into the environment for long periods of time only emerging to restock! I will be speaking at the first Cape Town Photo Club event of the year on Wednesday the 11th January 2017 about our life in the bush, and about our Okavango Project. Dinner: Please do stay for dinner. 2 course meal needs to be booked in advance R200 pp incl tip. (See below for details). Good day everyone. What a great year we had drifting over different areas of the Okavango Delta. Moremi Game Reserve, Khwairiver, Nxai Pans, Savuti & the Chobe River. Every area with its own unique character. 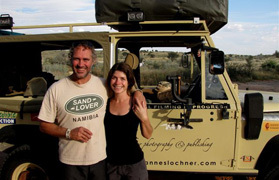 We ended our year with a few photographic Safaris and had lots of fun with all the guests. We also made it down to our beloved Kgalagadi and as usual it delivered great sightings. Me and Noa wish you a Merry Christmas & happy new year. 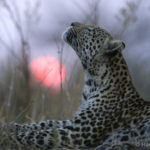 We are signing off for the year and will be back in the Delta early next year to finish off my Okavango Book-project. 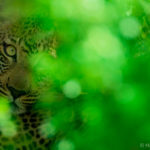 Today we share an image of a young female leopard hiding behind shrub on Chiefs Island. What a wonderful smell the first rains bring. After two Photographic Safaris in the Khwai/Savuti and the Kgalagadi we are back in Maun to get ready to do a bit of water-work on the Chobe River. The Khwai delivered as usual. Lions, four leopard sightings in one day, sixteen wild dogs in our camp all rounded off by the amazing food of Capture Africa. Temperatures rising into the forties, were making all species head down to the water allowing for amazing photography. The long haul down to the Kgalagadi was as usual also unbelievable. 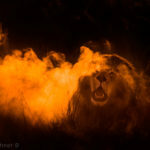 Lots of lions and birds of prey, as well as sad moments where a lion pride killed two cheetahs overnight. They were probably unexpectedly ambushed after drinking water at the KijKij waterhole. The first rain was short but the smell was something indescribable. Thanks to all our guests who made these trips unforgettable. For anyone interested in the Kgalagadi Safari for next year, be quick, there are only two spaces left for 26 November – 02 December 2017.